Posted on May 26, 2013 at 4:25 pm by Mary. In the first segment on “Efficient Cleaning“, I introduced the concept of working “smarter not harder” with five considerations: scope, method, approaches, resources and time. We first touched on the need to honestly scope out the daily work involved in cleaning a home through looking at a task and sizing up how frequently it needs to be done. Now we are ready to look at the second and third considerations: Method and Approach. A clean home environment has a much deeper impact in our daily lives–creating peaceful environments where we can focus on the people and projects that are most important. 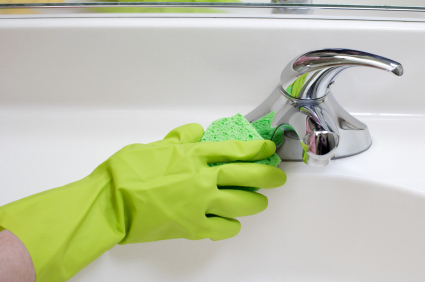 Cleaning efficiently means accomplishing what needs to be done in the least amount of time. Having the right method is key for making this a reality. Basic principles of clustering tasks and following patterns are essential in saving time and energy. For example: Dusting and straightening furniture and accessories in a pattern gives order to work and is a natural preparation for polishing furniture and cleaning fingerprints from mirrors and glass. The habit of saving the mopping and vacuuming until the last helps to assure us that any dust particles that have fallen to the floor will be picked up. These may seem to be simple ideas but having the right method, no matter how simple, always gives clarity to work and the satisfaction of a professional touch. The right approach to a task also can make all the difference in accomplishing it. For example: Will you do the task yourself or will you involve others? Will you do it in smaller chucks of time? We often feel that the complete care and cleaning of the home depends solely on us. This is a false assumption. It is healthy to include other family members both for their sake as well as our own. There are simple task that children can do once they have been instructed and according to their age. Both dusting and vacuuming can easily be shared with others as well as the cleaning of bathrooms. There are always those more time consuming tasks such as cleaning closets or garages that may need to be done in smaller chunks of time. This is where the calendar is essential in order to avoid procrastination. Having a schedule is the first and most important approach to accomplishing these tasks. Again, including the others, where appropriate, can help to make it happen in a more timely way. The HomeAdvantage 21 Topics Workbook contains ideas for practical methods and approaches as well as for sharing the care with the others in the home. Age appropriate tasks are also listed. Next time we will discuss the Resources and the Time Gluttons involved in cleaning. In the meantime, what are your favorite efficient cleaning tips? Please share them with a comment below.